If there’s one important element about a particular band’s album that will win me over more often than not, it would have to be their willingness to step outside the tried and true formula of most, and make an attempt at achieving something that is unique and fresh sounding. 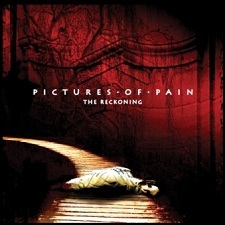 Having said that, not everyone who tries such a move is always that successful, and a perfect example of this is Norwegian act Pictures of Pain and their debut album The Reckoning. Founded as far back as 2004, there’s no denying that the five-piece act (comprising of vocalist Hans Helge Iversen, lead guitarist Rune Fredriksen (who’s also a member of Viking inspired black metal outfit Thundra), rhythm guitarist Arne Marton Tangjerd, bassist Roy Østrem and drummer Frode Gundersen) well and truly know their way around their instruments. A great example of this can be found on the opening track Betrayal, which combines elements of melodic black metal, progressive thrash and subtle traces of traditional old school metal (there’s an unmistakable Iron Maiden influence in some of the quieter moments within the song). Aside from the diversity of sounds heard in the music, vocalist Iversen has an impressive range too, with clean singing, growled efforts and high end screams only adding a greater depth of diversity to proceedings. All up, Betrayal is one hell of an opening track to the album, and one that isn’t all that easy to pigeonhole in the genre sense. Far Beyond is no less impressive despite not having the same number of genres thrown into its six minute running length, while the blackened thrash of Deviator and the technical execution heard throughout Final State are fine examples of where the band shift seamlessly from one sound to the next, without losing the listener in the process. Unfortunately, not everything works on the album. In their attempt to cover so much ground, some songs simply don’t flow as well as others, and therefore come across as trying too hard to do too much, and failing in the process. That’s not to say that the band fall short of ideas, because within songs such as Eternal Rage, the slower paced Sign of Times and Years of Disgrace, there’s some seriously great moments. But from a song writing point of view, the songs just fall short of the mark as a whole. Aside from the eight tracks that make up the album, the band have also included demo versions of From the Ashes and Guardian of Tears, both of which come from Demo 2006 and Demo 2005 respectively. Although hardly essential, they do at least show how far the band has come in their song writing since their initial recordings. Pictures of Pain’s debut may not be an all out winner, but it sure does boast some pretty impressive moments. And if the band manages to keep their progression moving forward, I have no doubt their follow up release will be something far more rewarding.